The following is the second in our series of three interviews with each of the jurors of the 2013 Juried Grand Prize. Mel Chin is a conceptual artist and activist who has been producing work since the 1970's. His work spans artistic genres, from land art to collage, installations, sculptures, video games, and scientific collaborations. He has reclaimed abandoned houses in Detroit and cultivated plants that absorb contaminants from soil. “The survival of my own ideas may not be as important as a condition I might create for others’ ideas to be realized,” says Chin, who often enlists entire neighborhoods or groups of students in creative partnerships. Chin also promotes works of art that have the ultimate effect of benefiting science or rejuvenating the economies of inner-city neighborhoods. He lives in North Carolina. We began by speaking about an ongoing project begun in 2007, Operation Paydirt. The project is a multidisciplinary, multi-city campaign to address the issue of lead contamination in poor neighborhoods. It includes impementation of a new lead remediation technique, as well as a project in which children are invited to draw "Fundred Dollar Bills," interpretations of hundred dollar bills. The drawings are being collected by armored truck to be delivered to congress and asked for an exchange of value, symbolic to financial, to address lead poisoning. This series of interviews is serving as a prelude to a panel discussant that will feature the three Grand Prize jurors, titled "Can Art Save Cities?" The free event will take place at 7:00 pm on Thursday, September 26 at Ladies Literary Club, 61 Sheldon Blvd SE Grand Rapids, MI. Kevin Buist: I wanted to start out by asking you about how Operation Paydirt and the Fundred Dollar Bill Project began. Mel Chin: I went down [to New Orleans] with Rick Lowe of Project Row Houses in Houston. I had seen him on the street in Houston, I said, ‘You goin’?’ he says, ‘Yeah, I’m goin’.’ So we went. And what I witnessed was not just the physical destruction of property, but the destruction of the social contract and the psychological turmoil it had created with people we were interviewing. That magnitude of destruction, as I wrote at the time, requires something of equal magnitude as a response. And I wasn’t prepared. So, I tried to conceive of a response, of what I could do, and that’s when I discovered the lead issue that had not been addressed. Even before Katrina, lead was present in the blood of so many children in the city of New Orleans, with little support to alleviate the crisis. That’s how this project was compelled into being. A project like this is not based solely on being an artist. It’s just being a citizen of the world, coming into a situation, and really, truly wanting to help, not trying to impose my artistic direction or create a work of art. In this case, it was applying the capacity of concept art to respond to a specific need. That was the approach; but I do not recommend orchestrating a career based on tracking down disasters and creating artworks out of it. That is not a healthy thing for any person to do, or for me, at least. After I got sensitive and empathetic to the situation, I was surprised and moved by the invisible and unjust nature of childhood lead poisoning, and I conceived, in moments, this artwork that could be done, not by me, but would have to be done by millions of other people, alongside me. It is a democratic experiment of expression, to see if, collectively, we can have an impact in our society. It’s not known yet, and there’s been a lot of coalition building, discussions with scientists, even implementations of lead transforming science, and this continues. So, I mean, it’s a lot slower than most projects. It’s one of those projects that once you start you have to stay committed. So, the intensity of the drawing project is that it’s fun of, course, but it’s a way of representing those in that generation who are not being heard while being most affected by a poisonous environmental threat. The value of creativity should somehow be represented and exchanged for the sponsorship of solutions that can make a difference. The Fundred Dollar Bill Project came about because, if you say you have a problem, and in the current economic climate you say there’re no funds, I ask, can we accept this human expression [the drawing of a hundred dollar bill] in an even exchange for the amount of money it would take to transform an entire city? By the way, I want to emphasize that the project is no longer focused just on New Orleans or lead in soil. It has evolved into representing all who have contributed and we are working out the means to take on the issue nationwide. KB: That’s great. I wanted to ask you specifically about the Safehouse element of it. It struck me that even though you’re travelling all around, it’s interesting to have one physical site be an element. Can you talk a little bit about how that came to be and its benefit? MC: Well the Safehouse is no longer there in New Orleans. 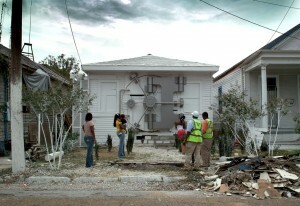 It was a temporary installation in the St. Roch neighborhood that was up from 2008 to 2010. I felt we needed an immediate iconic image for the project that also functioned to represent the people affected by lead poisoning. I was approached by a startup art project doing installations in abandoned properties, but, in truth, we chose that location because it’s in one of the worst crime-ridden and lead-polluted neighborhoods in New Orleans. We knew that children came out of [that house] compromised. So we had to make that safe. And, also, it’s another way of making work in public. It was a satellite project of Prospect.1 New Orleans [the first New Orleans biennial in 2008]. But, we went beyond that, I feel. We used the house as a way of introducing the project with our partners at that time, which were scientific, medical, and activist groups, and most importantly, the community that lived in that neighborhood. We had a presentation [of the Safehouse], before the Prospect opening, to the neighborhood. We had a street party to introduce the piece to hundreds of children and adults. It was called the ‘Love Where You Live Party.’ We opened [the Safehouse] and introduced the project to them and some of the first Fundreds were drawn by children in that neighborhood. It’s a way of rethinking how we place art in public spaces. For this particular piece we decided not to have an opening for art patrons but for the local community. It was to get approval and consent for the effort first from the folks that lived there and were affected by the problem. I felt we needed permission from the neighborhood to be there. For this pre-opening of the Safehouse, we hired the security and police, not to keep people out of their block party, but to protect the very people who lived in this community, who faced daily abuse from violence and police harassment. KB: With regard to the question, Can Art Save Cities?, I think that you’re a pretty unique artist because a lot of your projects have a very concrete way in which they intend to make a community better. Lead remediation is a quantifiable way to make a place better. If there’s less lead, people’s lives are literally better in a way that can be measured. One of the troubling aspects of this notion that art is going to make the city a better place is that it gets lost in the details, how does that actually happen? For a lot of people who may have a more traditional, object-oriented definition for what art is and what an artist is, they would be probably surprised by your practice and what it involves. How did you come to get involved in this kind of project? MC: There was a while when I stopped [making objects] during the Revival Field project. But, I have a continuing history of making personal objects and projects that public projects would have trouble addressing . . . in the psychological and philosophical realm. Some of that will be evident in my retrospective that’s coming up in New Orleans in 2014. We’re in the thick of things right now getting ready for that. As for environmental projects, there have been, maybe, four of them over my lifetime. What happened in New Orleans was very simple: How could I not go down to help, as a person? That’s where it began. The natural disaster of Katrina brought me down to the city, but its complexity made it necessary to return, again and again, to conduct research to find a way to assist. Through this I uncovered the pre-existing, persistent problem of lead poisoning. But the lead poisoning problem is an ongoing, tragic story. It is the slow, ongoing disaster that is related to crime, educational deficits, and poverty in almost every American city. In New Orleans, a violent storm met a persistent, post-industrial, environmental, man-made disaster; met the man-made engineering disaster; resulted in a political disaster; and added to a sociological and environmental disaster. Everything you can imagine, right? KB: Right. One thing I’ve always admired about your work is this idea of creating a platform for another’s voice being even more important than having your own say. MC: I think it is because what I’ve had to say is based on other things that have come before, and I can’t ignore that. Then the question is: do you want to be part of that engagement so you can contribute to that ongoing conversation? It can be done with objects, it can be done with music, with writing. It can be done with many things. It does not have to be a project that is heavily focused on social transformation; it can come from many sources. Maybe it’s best not to be so compartmentalized in our approaches to creativity, and, also, not to be entrapped by our own notions of what this word ‘art’ has constituted over time. KB: So, I’m going to give you a hypothetical situation. If a city council member, a mayor, some official from some city approached you and they said, ‘We want to revitalize and rejuvenate our city. People have been fleeing to the suburbs and we want to revitalize downtown and we want art to be a big part of that.’ Before knowing the specifics of the situation of this hypothetical city, what are some guiding principles that you would offer to them as they embark on that kind of an endeavor? MC: Well, there are a lot of warnings. Back to your first question you mentioned that intrigues me, ‘can art save cities?’ My first answer immediately is, no. Obviously, no. It’s almost like, [at one time] engineers were expected to save us, and look where we are now, one generation later. Why put it in the lonely artists’ hands? That being said, perhaps I would like to be part of the attempt. The difference, I think, is not saying, ‘can art save cities?,’ but ‘can we save cities?’ Is it worthy to save cities? Then it takes a whole learning curve and analysis of the situation from all the varied disciplines that would have to come into play. The first question I would have for any mayor is, are you really serious about this, and what do you mean by ‘saving?’ What do you mean by community? The one you’re part of, or the one that is there? Or, one that can be rebuilt in another way? Any kind of suggestion of salvation should be met by a greater question: what is the definition of that to the so-called ‘client,’ right? MC: My definition of art, the way I look at it, includes the question, ‘How can I set up a collaborative evolution?’ This is the thing about art; it embodies what the whole process of a life could be. It is not necessarily for good or bad, because those terms are relative, but the question is: how can you set up a condition that truly allows change; that truly promotes an evolutionary situation? Can you catalyze that? There can be delusions that build up during a career that can trap the evolution that I feel is necessary to be an artist. So these are the internal and larger questions that have to come to bear first. Obviously, in my review of a lot of cities I’ve been to, things can be very bad in different neighborhoods. Revitalization of a city is a collective effort. Also, this notion of good is largely based on economics. I kind of look at it as, ‘well, when you’ve been down so long, it seems like up to me.’ I base it more on the flow of ideas and how healthy a climate is. KB: I think people rush to economics because it’s measurable. They have an easier way to measure it than they do other things. MC: I would never dismiss it. I think that’s being foolish to say ‘oh, I’m beyond that.’ No, that’s part of it. KB: Yes, but it’s not the whole picture by any means. MC: So, it goes back to basic issues; let’s talk about what you mean when you say ‘quality of life.’ For yourself or for others? There are a lot of things that we have to really come to grips with. What do we really mean? I think that’s where the art comes in. Can it provide some further meaning? It’s a larger philosophical discussion. KB: No, it is, and I’m glad that you answered the question ‘can art save cities?’ with a ‘no’ because it’s – and I don’t know if everyone knows this – but it’s an intentionally flawed premise and I’m hoping that the discussion will not attempt to answer the question so much as question the question, which I think you’ve been doing and I appreciate that. MC: Well, that’s what I say. If Anne [Pasternak] and Manon [Slome] have their views on it that are more positive, that’d be great, because I’d like to hear it. Being good friends, we may all say no. I don’t know, but that’s my first view of it and you’ve read me right, absolutely. KB: I want this to be a way to highlight the wisdom that each of you can bring to this discussion, so I don’t want to rush to my own conclusions but my instinct is the same, that when it’s framed that simply, the simple answer is no. But of course there’s a long answer about the way that art can play a role in a much wider and more holistic approach to what community is and what human activity is happening in the city and how that creates meaning and vitality. MC: That’s right. To be holistic, we would have to include a role for art. But, what kind of art? And, if included, could we take up a challenge to expand the definition of art, to scale up the critique of our own practice? ‘Art’ has been around for a long time, but aside from the surviving visual and poetic contributions, the historical record has not been very promising. We haven’t done too well. Now, devastating things are happening, not just on a city level, but on a global level. Even if art, along with other disciplines, can save the cities; then what? Unseen things seem to cause collapse around us and I have to also be willing to consider that maybe what I’ve been doing is aiding and abetting . . . and maybe it’s high time to get wiser. MC: I’m glad to be invited to be a pessimist here. But the option of doing nothing is, frankly, boring.